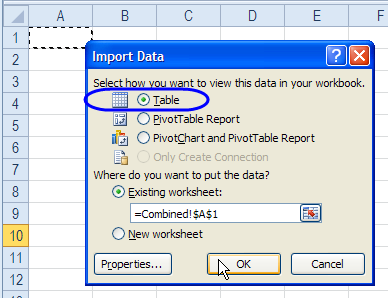 How to create a Cartesian join (cross join) between two tables in Excel, using Microsoft Query. This connects all items in table 1 with all items in table 2, to list all possible combinations. 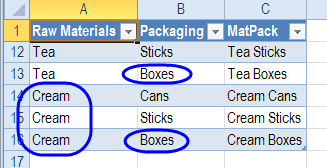 In this example, there are two tables -- Raw Materials and Packaging -- and each table is on a separate worksheet. The Raw Materials table is on the sheet named Materials, and the Packaging table is on the sheet named Packaging. 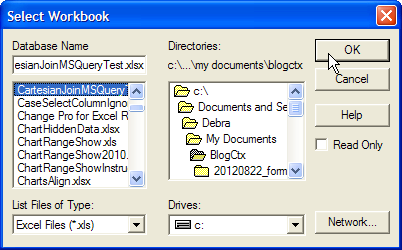 The third sheet in the workbook is named Combined, and this is where the query results will be stored. 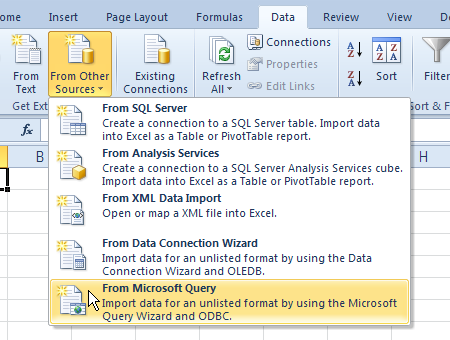 To create the Cartesian (cross) join, you'll use MS Query. 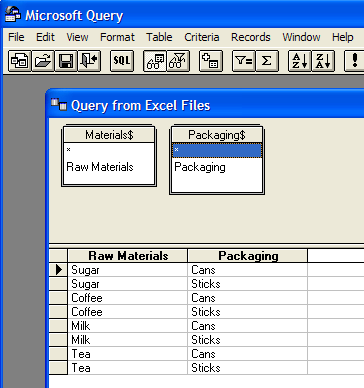 In the Select Workbook window, locate and select the current workbook, and click OK.
Click Materials$, and click the arrow to put the Raw Materials column in the query. 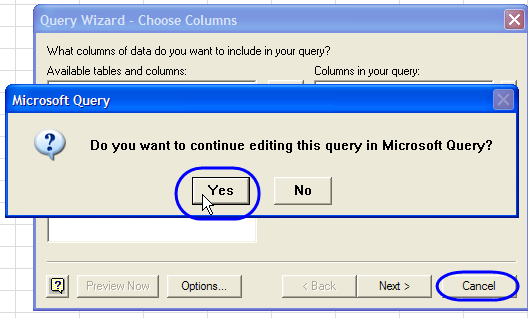 Click Cancel, to close the Query Wizard, and click Yes when prompted. 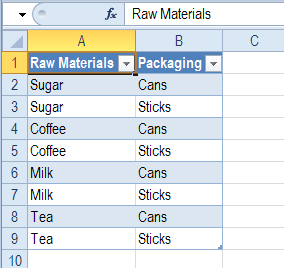 In Microsoft Query, double-click on Raw Materials in the Materials$ table, to add it to the query grid. 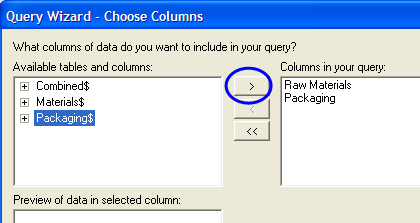 Then, double-click on Packaging, to add it to the query grid. 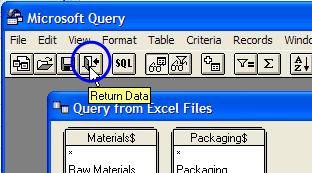 Click the Return Data button, to send the data to Excel. It might take a few seconds, but then the Import Data window will open. 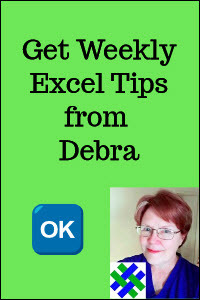 Select the cell on the worksheet where you want to place the query results, and click OK.
A table is created, and shows all the items from each table, in all possible combinations. 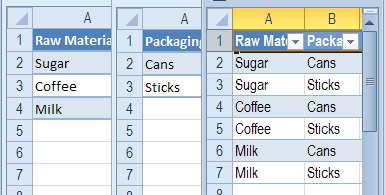 You can add formulas to the table, in a new column. 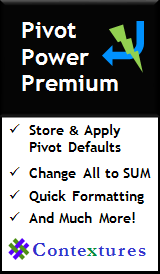 The formulas will automatically adjust if the source tables are changed. 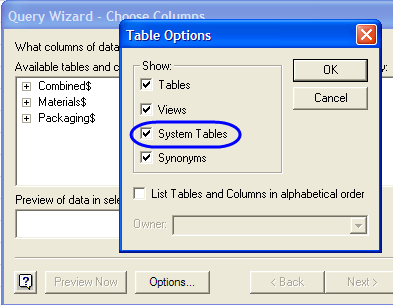 A new column is automatically included in the table. 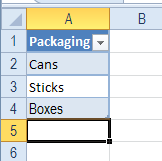 Then, copy the formula down to the last row of data in the table. 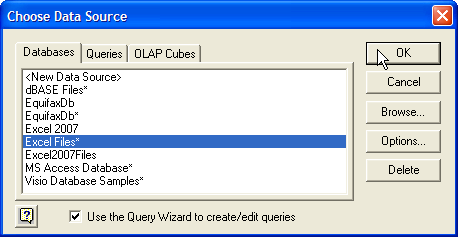 You can update the source tables, and then update the query results table, to show the revised data. Add a new item to each of the source tables. In this example, Boxes was added to the Packaging list, and Cream was added to the Raw Materials list. 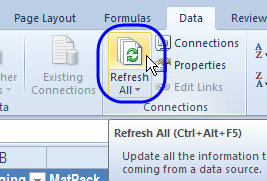 On the Excel Ribbon, click the Data tab, and click Refresh All. The new items are shown in the updated query results table. In the Select Workbook window, locate and select the new workbook, and click OK. If the file name or location will change frequently, you can use programming to automatically change the file location in the connection. Paste the following code -- FixQueryConnection -- into a regular module in the workbook, and then run the code when the workbook opens, by adding a Workbook_Open event. This code was tested in Excel 2010 (32-bit), and might need to be adjusted for other versions of Excel. 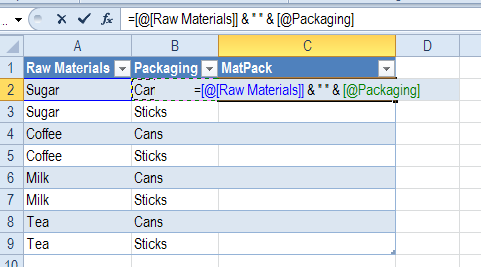 strPath = ActiveWorkbook.Path & "\"
strQry = "Query from Excel Files"
strCmd = "SELECT `Materials$`.`Raw Materials`, `Packaging$`.Packaging "
strCmd = strCmd & "FROM `Materials$` `Materials$`, `Packaging$` `Packaging$`"
strConn = strConn & ";DriverId=790;MaxBufferSize=2048;PageTimeout=5;"